The wakefulness question was soon rendered moot as the sky opened up with a rain that sounded like a platoon of Fred Astaires tap-dancing on the cabin’s corrugated metal roof. Just when we thought it couldn’t get any more torrential, the rain let loose with a drowning, fire-hose kind of gushing, accented now and then by a guava dropping on our roof with a bazooka-like “KA-THUNK.” My wife and I laughed — kind of nervously. The downpour was just beyond the bug screens that comprised our walls, and only the roof’s wide eaves kept the storm from splashing in on us. “Good grief!” I shouted to the weather gods. 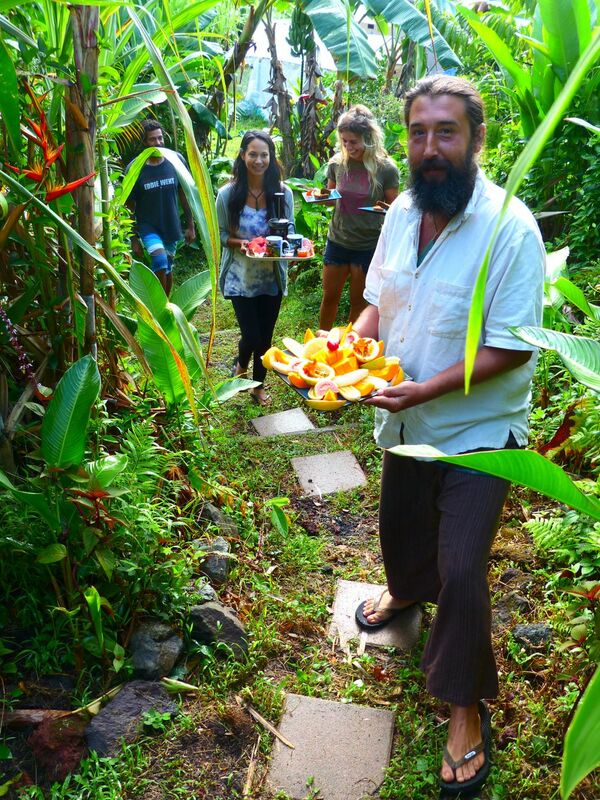 We were one with nature, as was our goal in spending a couple of nights at this off-the-grid organic fruit farm on the Kilauea volcano’s lower slopes, a few miles outside of Pahoa and 45 minutes south of Hilo. For the moment, we were just hoping that being united with nature wouldn’t involve floating down the hill into the Pacific. The big island of Hawaii has long been known as a place for adventure. 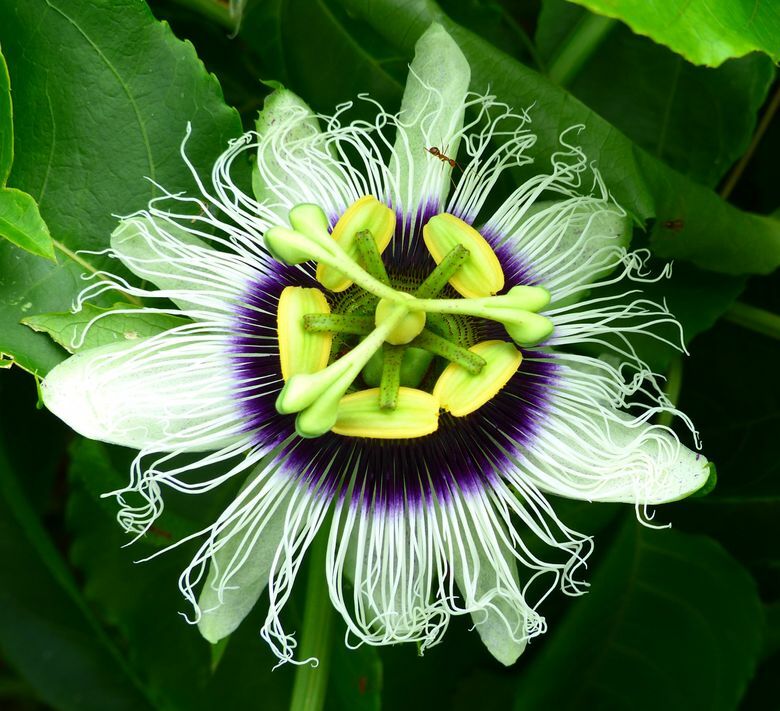 With the arrival of evermore visitors and the continual widening of highways, adventure is more elusive than when we first visited in the 1980s and stayed with taro farmer Tom Araki in the secluded Waipio Valley, living by oil lamps and taking cold showers. But we found adventure once again in 2017 — on Airbnb. 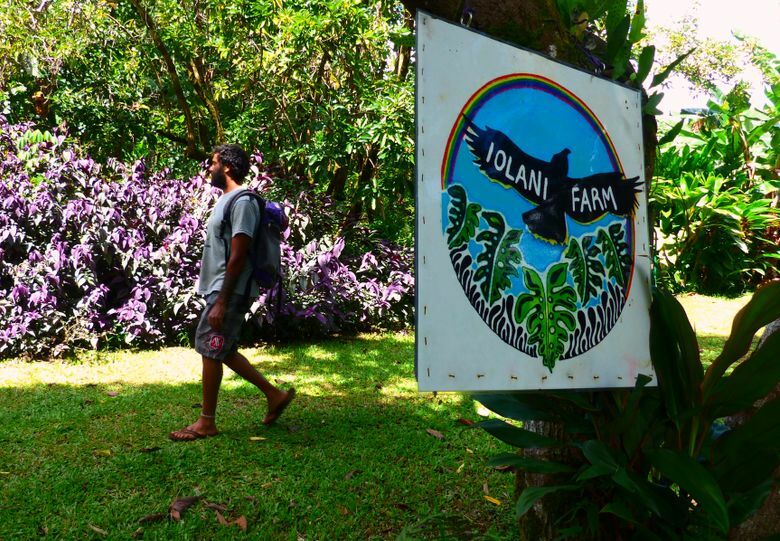 There we happened upon a listing for I`olani Farm (iolanifarmhawaii.com), the 3-year-old labor of love of John and Ariel Douvris. When John’s family sold his late grandfather’s home in San Francisco, the proceeds enabled them to buy 20 acres of former sugar-cane farmland in the Puna District, where steam vents in the woods testify to the deeply brewing stews of red lava that occasionally break loose from uphill craters and cones and meander to the sea within a dozen miles or so along this coast. 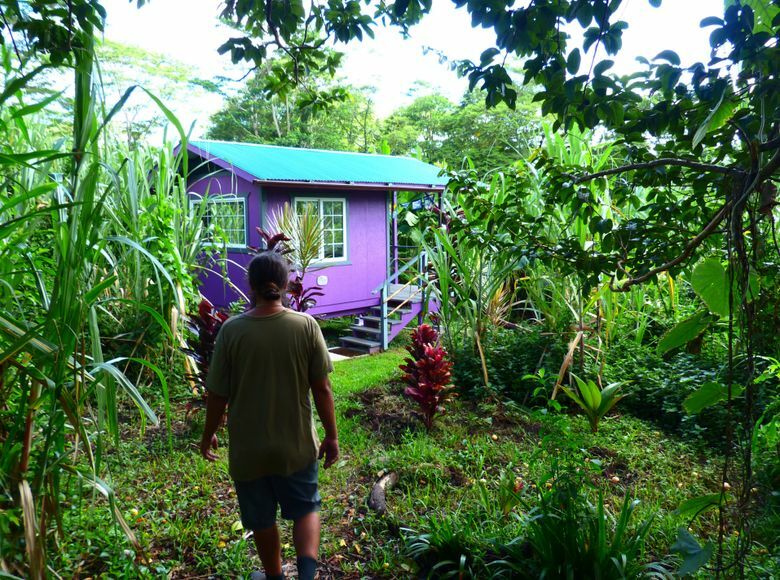 After bulldozing a clearing among the old cane, vines and many trees that have grown up, the couple built a two-story house, a bathhouse with flush toilets and hot-water shower, and three one-room rental cabins ($59 a night when we stayed). They’ve also planted scores of tropical trees and fruit-bearing plants. Electricity comes from solar panels. Water comes from catchment off the roofs, with a treatment system for drinking water. It’s pure pioneering, 21st-century Hawaiian style. We’d been advised that four-wheel drive wouldn’t be a bad idea for navigating the farm’s narrow, mile-long dirt, rock and mud-puddle driveway. But our rented Hyundai sedan did fine if we took it slowly and didn’t pause in puddles. We arrived amid a steady rain. Maui-born John, 34, outside working in his shirt sleeves, greeted us with a big umbrella as the rain sluiced off his long hair, curled up in a man-bun above his deeply tanned face. He launched into an energetic story of how they came to be here and what they’ve planted. A chef for 10 years, he previously worked in Switzerland, Australia, Maui, the Greek Islands, New Zealand, India and Thailand (where he met his wife, another American traveler). 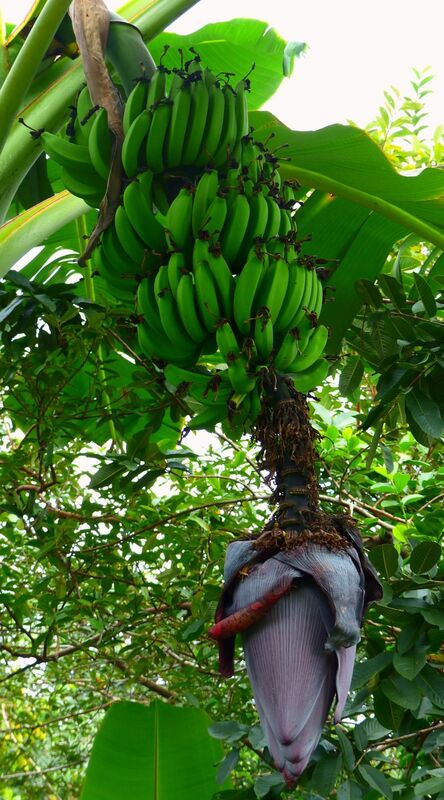 For a chef, having a tropical farm where he can grow anything he likes is a dream, John professed, though all the things he manages “can make you a little insane at times,” he added with a grin. He showed us the facilities, including a shelf at the bathhouse where we could charge phones. Daytime charging is encouraged — solar, remember? — and we were surprised to see we had cell service; AT&T 4G is best, we were told. Otherwise, there are no AC power plugs. The cabins come with solar fairy-lights and a rechargeable electric lantern. Looking for a low-tech vacation? Here’s your unplugged paradise. That combination of a chef host and a burgeoning tropical garden make I`olani Farm a dream for diners, too. Sign up for dinner (a screaming bargain at $25 a person) and breakfast (ditto, at $15) and you’ll enjoy the garden’s bounty — whatever is ripe and ready to eat. All dishes are vegetarian. By candlelight on the screened lanai of the main house, with slack-key guitar music piped in via Pandora, John started us with a platter of salad with feathered slices of giant, tree-ripened avocado along with lettuce, carrot, radish, peppery nasturtium flowers and a scattering of sweet poha berries, like a miniature yellow tomato, native to Peru. It was all grown a few steps away. The main dish was Pad Kee Mao noodles with Thai basil, mildly spiced (at our request) with green onion, and dressed with wingbeans (native to the Philippines), pumpkin flowers, Okinawa spinach, Thai pink egg tomatoes and macadamia nuts. Sides included chips of breadfruit (“ulu,” to Hawaiians) fried in coconut oil, with a small bowl of green papaya salad flavored with Kafir lime. Dessert was warm-from-the-oven banana bread made from berry bananas, also grown on the farm. If good food isn’t nurturing enough, you can supplement that with private yoga or healing treatments that are Ariel’s specialty. But we were blissfully sated, and with the aid of a headlamp I’d packed from home, we trundled back along a path dimly marked by solar-powered lights to our jungle cabin, ducking beneath a pendulum of ripening bananas and past blooming heliconia flowers. The air was a heady, moisture-rich blend of aromas — of woodsy earth; of sweet, rotting guavas underfoot, all riotously oxygenated by rampant chlorophyll. It turned out we slept well, awakened only occasionally by a guava bombardment. The sun shone the next morning. After an amazing breakfast — astonishingly, we could eat again — of fresh fruit and local Ka’u coffee delivered to our cabin, I lugged a large “Let’s Do This” orange bucket from Home Depot and helped to harvest grapefruit-sized avocados from big trees growing wild in John and Ariel’s woods. I had volunteered because I wanted to get a sense of life on the farm. I accompanied John and two farmworkers, Justina Meyer, 23, from Long Island, New York, and Adrian Joyiens, 35, from Arizona, who were trading their work for room and board (in this case, the “room” being a covered camping platform). 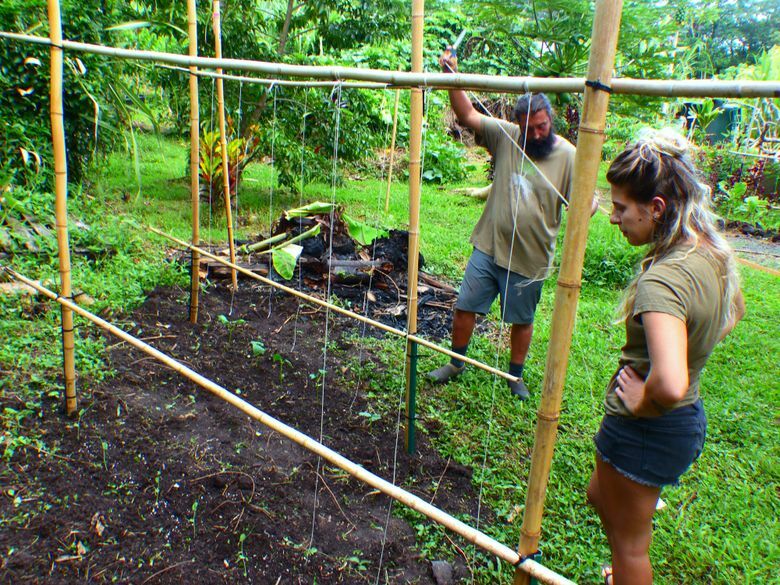 Adrian hooked up with I`olani through the WWOOF (World Wide Opportunities on Organic Farms) organization, while Justina discovered the farm as a guest and just fell in love with the place. “I respect everything they’re doing here, I like the sustainability,” she told me. 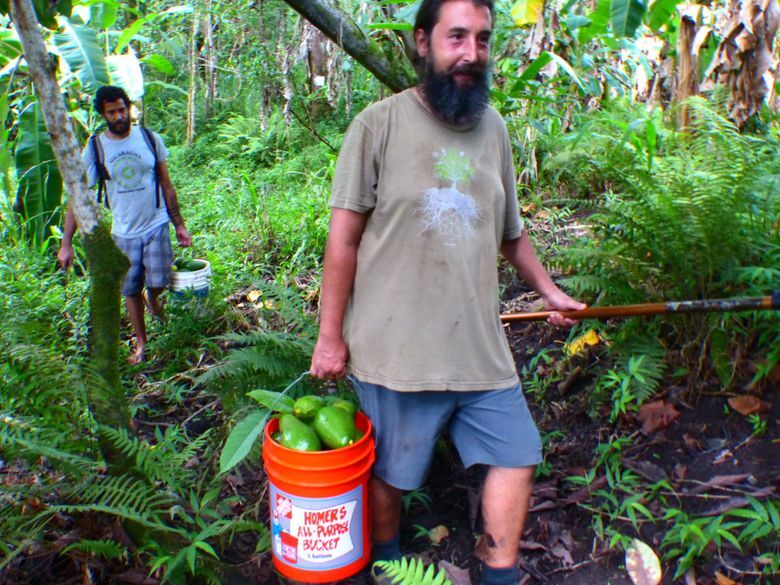 As we wandered up a muddy ravine on an old pig-hunting trail past jackfruit trees and freshly planted cacao saplings, John used an extendible painter’s pole fitted with a clawlike scoop to reach high into avocado trees and bring the ripe fruit down to our buckets. We came upon a mud wallow used by wild pigs. Pigs are common on this part of the island, including big boars with intimidating tusks. A hollowed indentation in the mud drew our attention. “You can see the size of the pig’s belly,” Adrian pointed out. We returned to the farmhouse with two 5-gallon buckets and a knapsack stuffed with avocados, some to be consumed on the farm and some to be sold to nearby natural-food stores. He nurtures a mishmash of crops. In each cabin look for a numbered map of the farm that names more than 90 varieties of plants. It’s far from being a monoculture operation. “It’s a lot more work but in the end it’s a lot better for the whole circle of life,” John said. As we finally departed on the narrow and puddled drive, we’d driven a short ways when I noticed some globular, dark objects on the road ahead. Normally I’d have just kept driving. But wait, were those avocados? My wife jumped out and came back with three big fat ones that would have just been crushed beneath our wheels. Mmm. Our view of nature’s bounty had been reawakened. Pick up some chips? Maybe some salsa? This would be a luscious lunch. 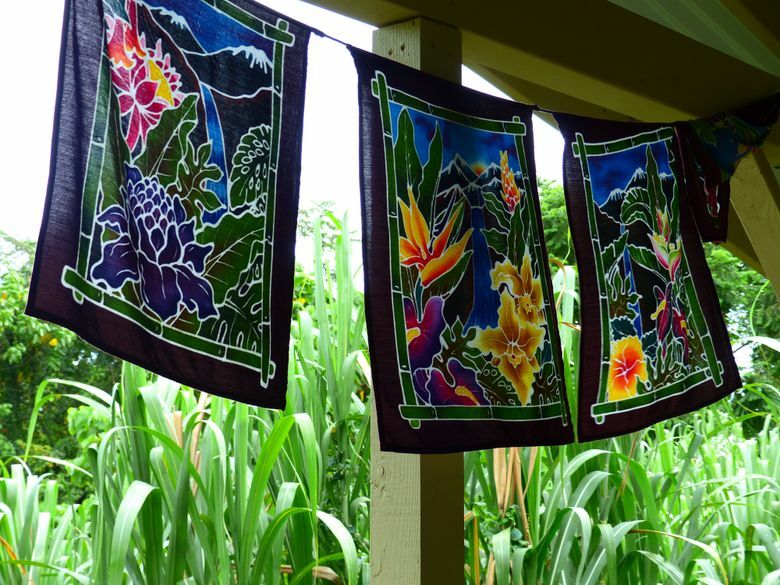 • Arnott’s Famous Lodging and Adventures operates a Hilo lodge (with offerings ranging from camping to dormitories to private suites) and guided outings for budget travelers; arnottslodge.com. 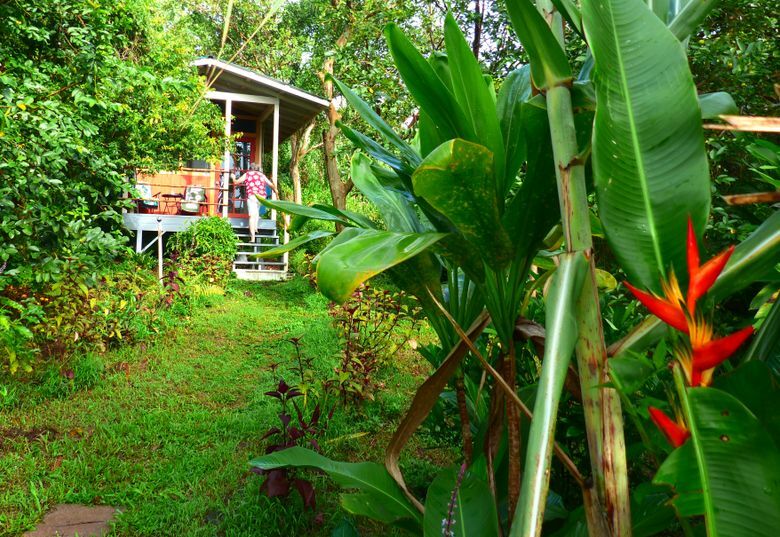 • Google “Airbnb Hawaii treehouses” and you’ll be amazed at what comes up, such as the stunning multilevel Treehouse at Kilauea Volcano ($289/night, with hot tub in the branches), as well as treehouses on Maui and Oahu. • Rappel down a 120-foot private waterfall when you stay at the Inn at Kulaniapia, outside Hilo; waterfall.net. 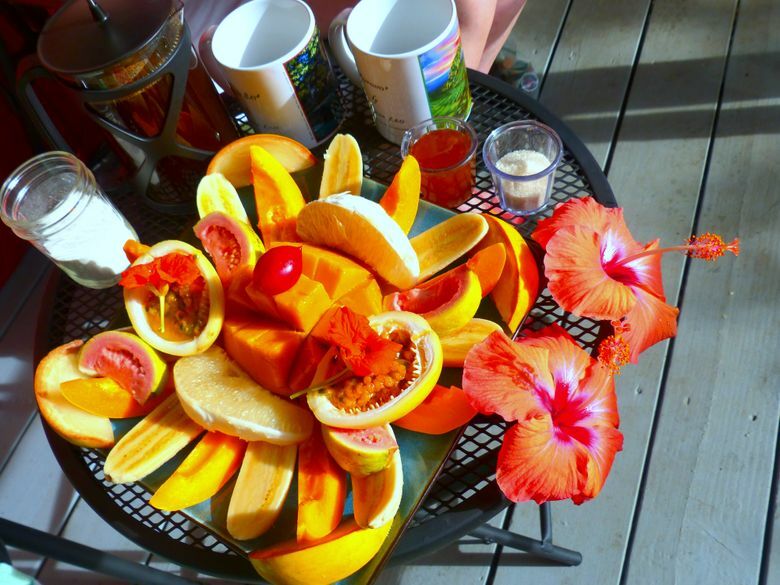 • Dragonfly Ranch Healing Arts Center treehouse-style bed-and-breakfast is in the Honaunau area, south of Kailua-Kona, with website testimonials from such guests as Brian Wilson of the Beach Boys; dragonflyranch.com. • Share your own favorite adventure lodging finds in Hawaii; click on comments below.